The Butterball Turkey Talk-Line is on fire about now, taking all your turkey cooking questions through Christmas. As they say: "Operators are standing by." Call 1-800 BUTTERBALL (1-800-288-8372), and don't be shy, they've heard it all. Call it "Turkey Cooking for Dummies." 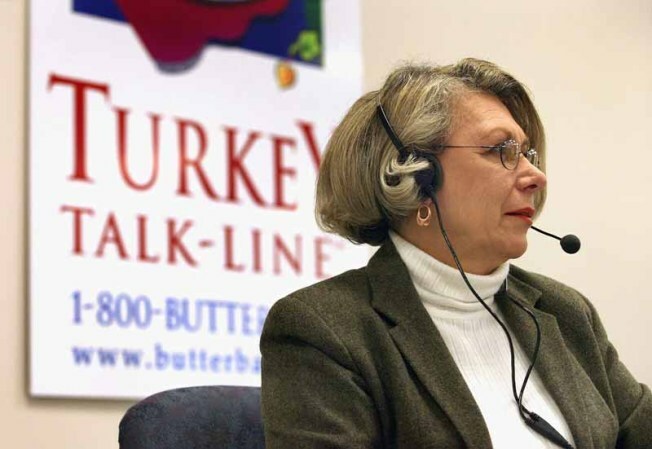 The Butterball Turkey Talk-Line, stuffing in 29 years now, has become a holiday tradition. Fifty professional nutritionists and home economists cheerfully answer more than 100,000 of our questions every holiday season on defrosting/basting/stuffing/cooking turkey, making sure you have a safe and tasty holiday season -- and that you don't screw up the big dinner in front of your family and friends. Hours of operation are 7 a.m. to 7 p.m. with emergency hours on Thanksgiving -- 5 a.m. to 5 p.m.
And if you are all about new and different, there are other turkey hotliines out there. Many turkey processors provide telephone help. Just check online for the brand of your choice. And if your turkey is safely in the oven but you've tripped over a side dish, just call the FDA hotline at 1-888-SAFEFOOD (1-888-723-3366). With all this help, what could go wrong? Don't ask!